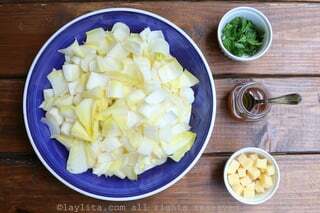 This simple and refreshing endive salad with aged cheese is an easy to make French style salad. It combines the lightness of endives and their refreshing crunchiness, with the depth and substance of aged cheese. 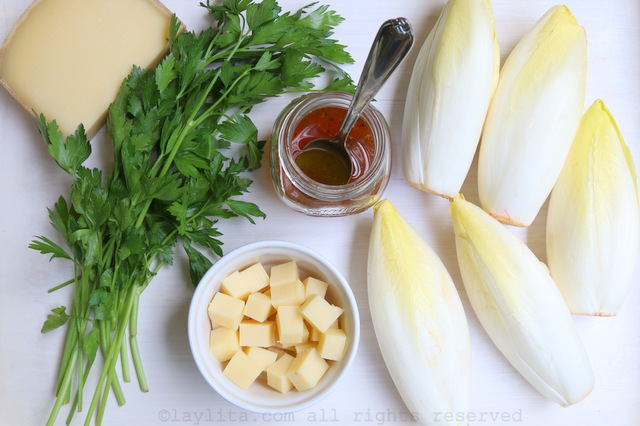 This endive salad recipe is made with sliced Belgian endives, a nice aged cheese like comte/gruyere/emmental, fresh parsley, and red wine vinaigrette dressing. 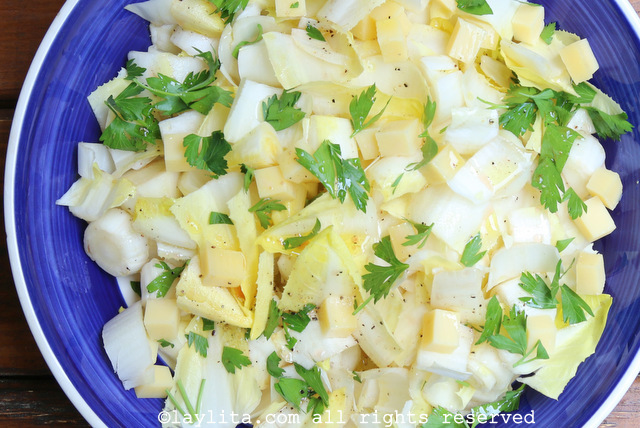 Belgian endives are a chicory leaf salad vegetable; they have an oval shape and a pale yellow/white color. Their flavor is slightly bittersweet, which is perfect for combining with cheese. 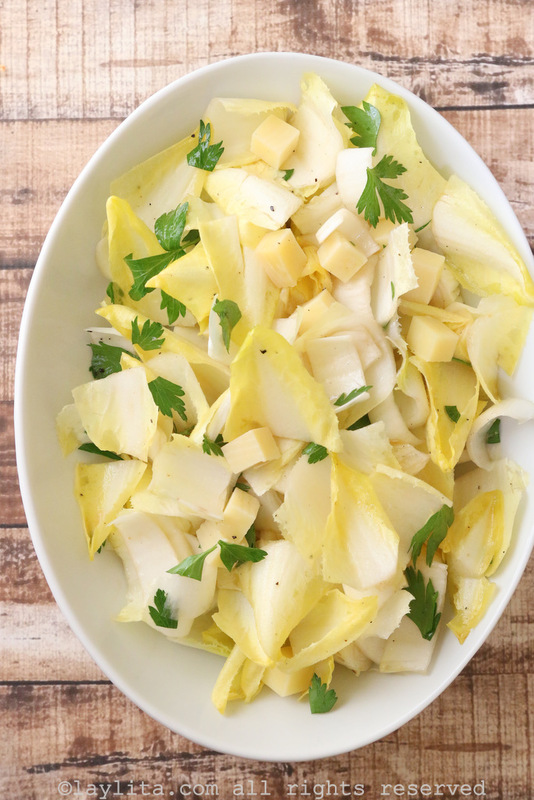 This simple endive salad with cheese is a tasty and refreshing salad; it's made with sliced Belgian endives, aged cheese, parsley, and red wine vinaigrette dressing. 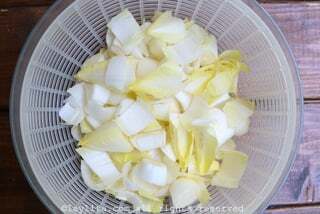 Cut and remove about 1/2 inch from the bottom of the endives and cut them into slices, about 2-3 inches each. You can also slice the hearts or centers into halves or quarters. 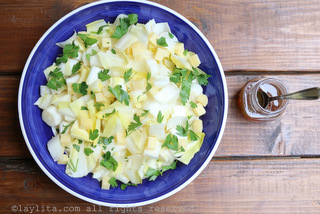 For the red wine vinaigrette, combine the olive oil, vinegar, salt and pepper in a small bowl and mix well using a fork. You can also combine them in small jar with a tight lid and shake to mix well. 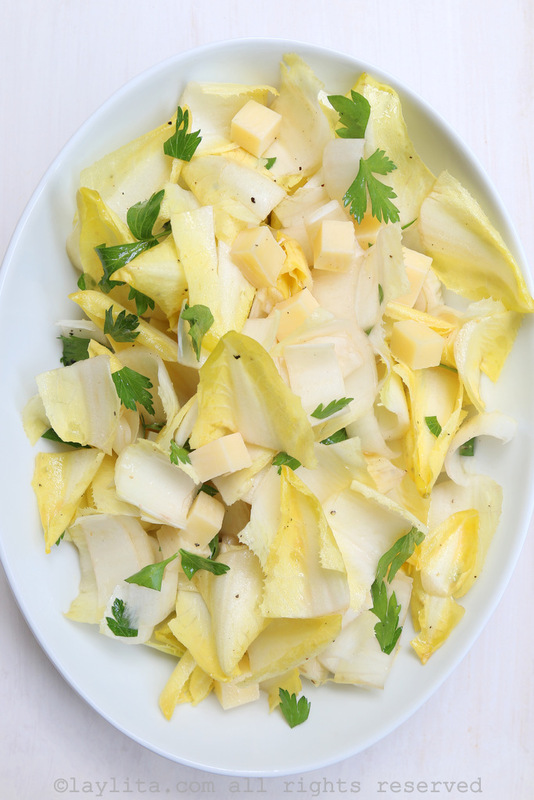 Place the endives in a salad bowl, add the aged cheese cubes, and the chopped parsley. Drizzle with the red wine vinegar dressing, mix/toss the salad, and serve immediately. 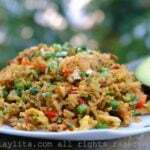 When I was a kid my mom made this dish, it was simple to prepare and was a change from the usual salad. 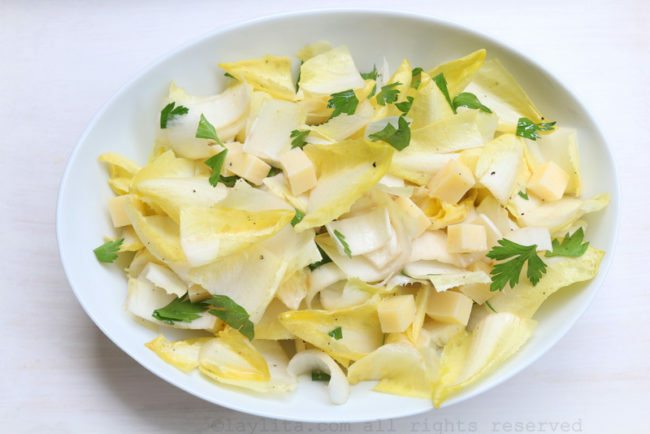 She would cut the endives in small slices, which made it easy for kids to eat without using a knife. Many of our salads used lemon or vinegar in the dressing. Endives were no exception. I recommend a vinegar dressing as it matches better with the taste of cheese – like red wine. 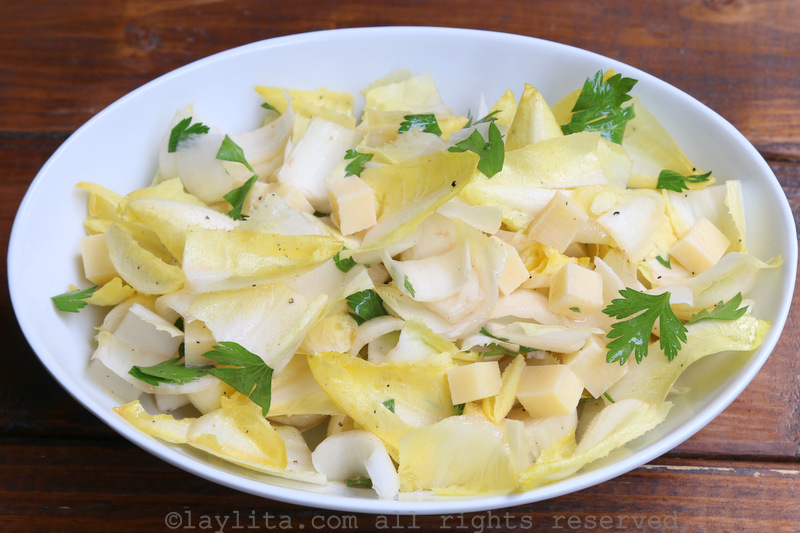 You can find Belgian endives, the variety typically used for this salad, at your local grocery store in every season. 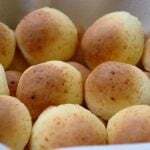 For this recipe you can use any cheese aged more than 6 months, such as gruyere, emmental, comté, manchego, etc. 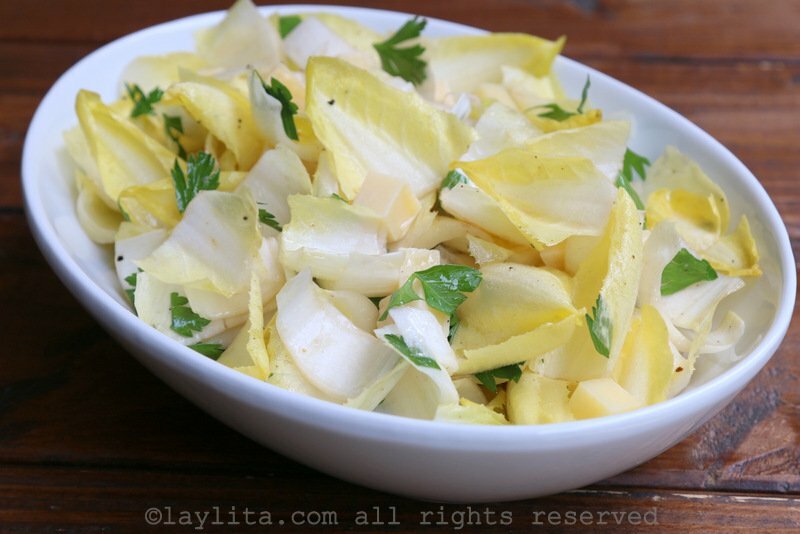 There are many variations of endive salads, which highlights the versatility of endives, and you can also use a blue cheese, such as roquefort or gorgonzola. This salad can be served as a side salad or as an appetizer salad.